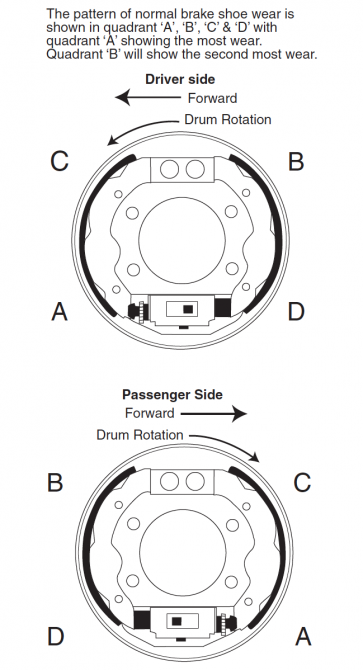 Your EZGO cart is fitted with a mechanically initiated rear drum brake system. The braking systems contains a service brake and park brake pedal, release linkage for park brake, compensator system, equalizer link, braking cables and wheel brake systems that self adjust. 1. Inspection of brake pedal return bumper. Ensure the brake pedal is meeting the pedal return bumper when disengaged. 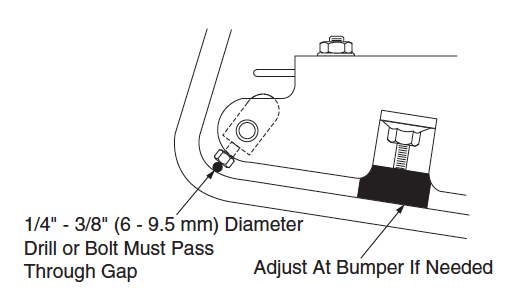 The bumper should be in good condition whereby a 1/4 – 3/8″ (6 – 9.5 mm) space occurs between the setscrew heads of the kick-off cam and brake pedal arm. 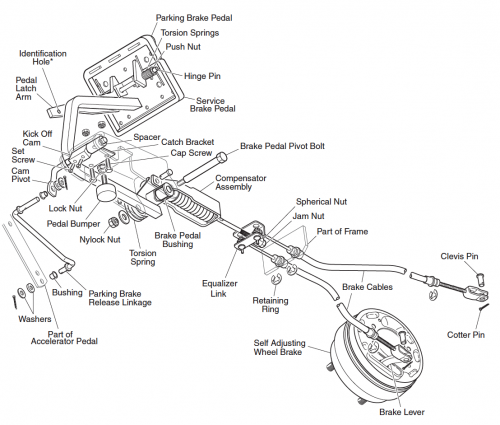 If necessary replace the brake pedal system. 2. Inspection of brake pedal return. Engage the brake and release. 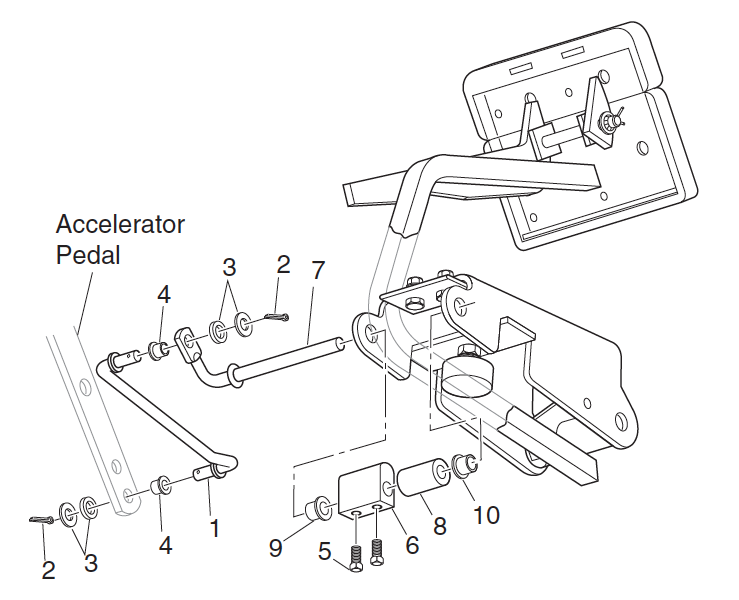 The brake pedal arm should contact the pedal bumper when disengaged. 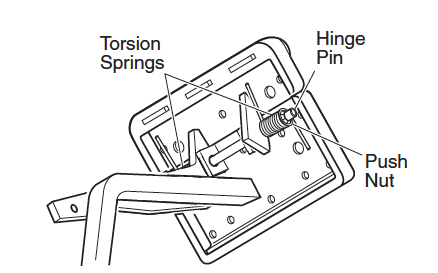 The torsion spring should be wrapped around the pedal and frame. Should the pedal have a slow return or not return home fully then the bushings and pivot bolt needs replacement. If necessary replace all pedal, spring, bushings and hold down bolt. 3. Inspection of the brake pedal for free travel. 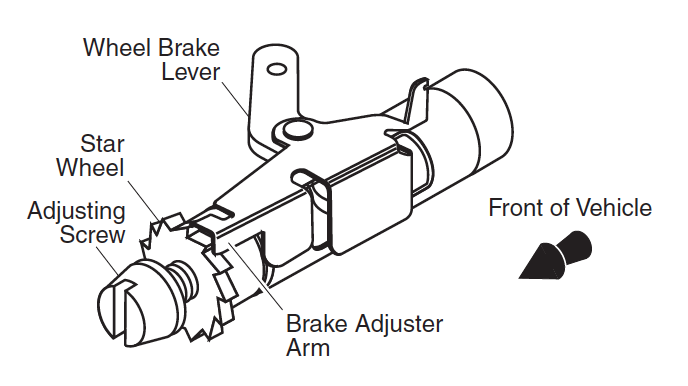 Ensure the brake pedal has free travel at the point where the brake shoes first comes into contact with the brake drum. If too much free travel is experienced then you have a problem with either of your wheel brakes not self-adjusting or cables/linkages wear. Inappropriate pedal free travel means you have issues with either of wheel brake self-adjustment or brake linkages. 4. Inspection of the brake cables. Look for damage or fraying of the inner cable and lack of fluid motion when pedal is engaged / disengaged. Ensure the cables are correct positioned within the cable supports. If any issues are experienced replace the cables and equalizers together. 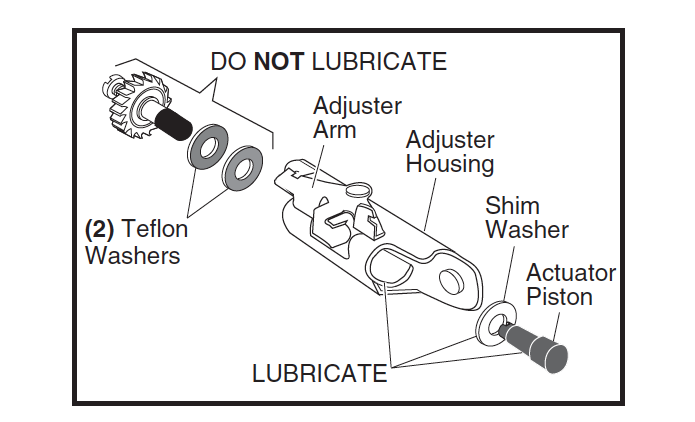 Inspect the clevis pins attached to the brake lever. The clevis pins must be slack when the brake is disengaged. 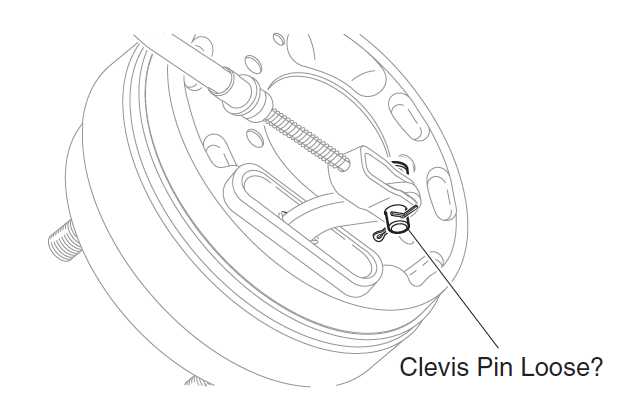 IF the clevis pins are tight and everything else associated with the brake system is working correctly then the issue lies with the wheel brake. 6. 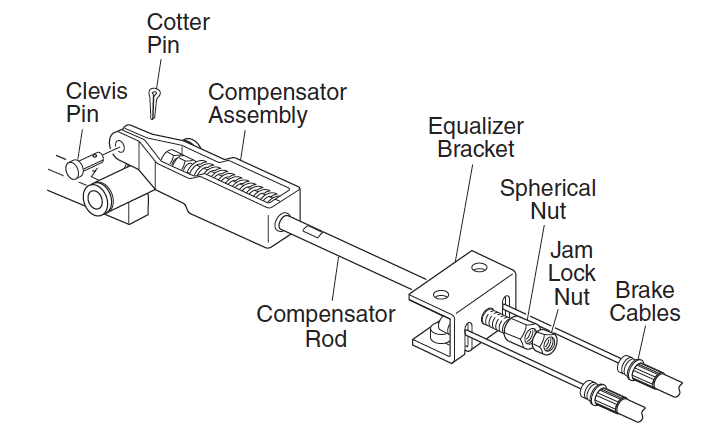 Inspection of the brake cable equalizer linkage. Carry out inspection looking for corrosion, damage, wear or severe misalignment Replace as necessary. 7. Inspection of the compensator assembly. Carry out inspection for wear, corrosion and damage. Replace as necessary. 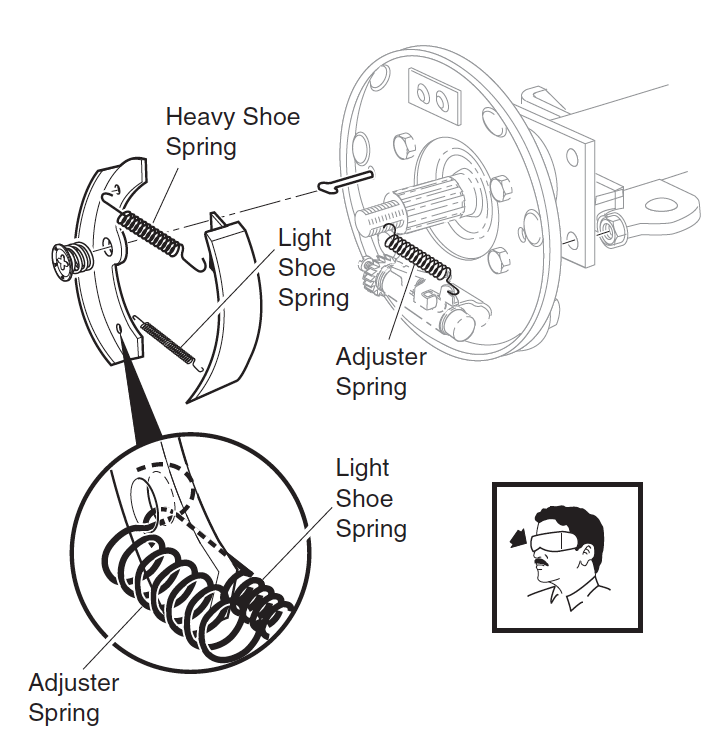 Ensure park brake is off and then check compensator spring is 3 15/16” (10cm) long. If you need to lengthen or shorten the spring conduct this at the spring’s nuts at the front of the cart. 8. Inspection of parking brake pedal hinge. Carry out inspection for damaged or corroded springs and ensure the hinge pin retracts appropriately. 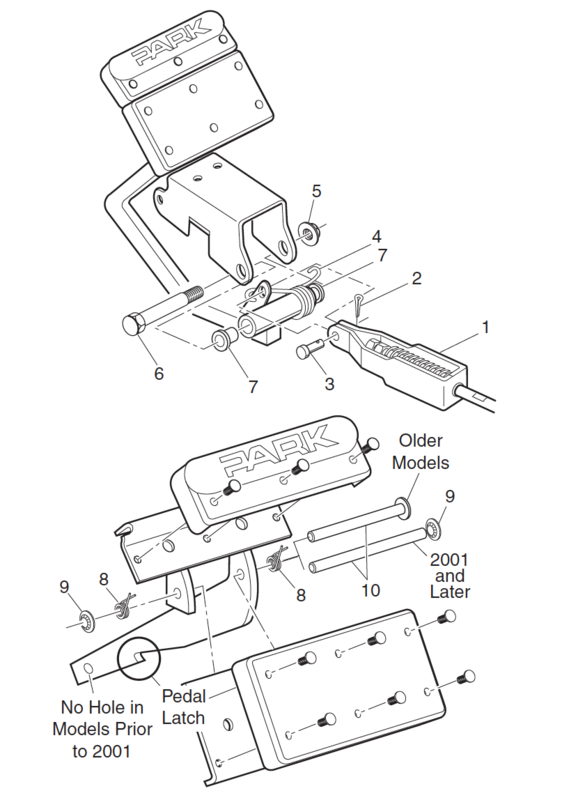 Engage park brake pedal to check smooth operation. 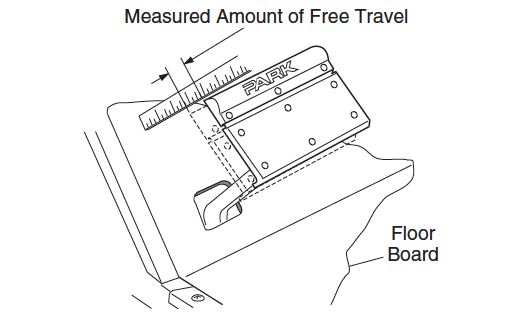 The park brake should automatically disengage when the accelerator pedal is energized. 10.Inspection of catch bracket and latch arm. Inspect for wear, damage and corrosion and replace if found. 11. Inspect the parking brake kick-off cam. Carry out inspection for wear, damage and corrosion and ensure optimum adjustment. Engage the park brake and check that no gap exists between the cam top and latch arm. If necessary adjust the kick-off cam. 12.Inspection of kick-off cam linkage and bushings. Carry out inspection for wear corrosion and damage. The pivot cam and bushings should be free to rotate and have no signs of rust. The kick-off cam should rotate when the accelerator pedal is pushed. Without affecting the adjuster mechanisms remove excess debris, dust and dirt from the drum with a brush. 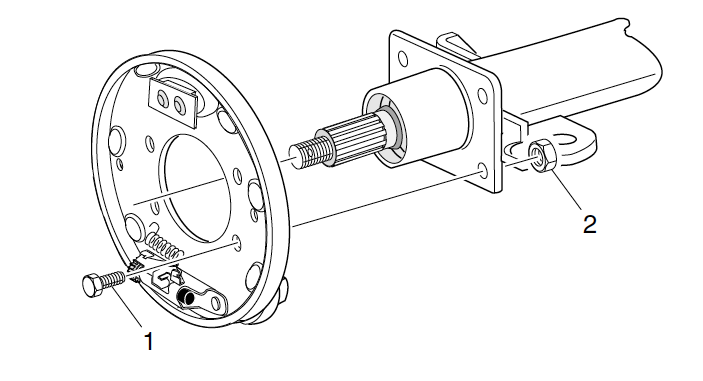 In the event of overheating, scoring or galling, change the brake drum. 3. Carry out inspection of axle seal and thrust washer for oil seepage. 4. Carry out inspection on condition and operation of adjuster mechanism. Carry out inspection of brake lever for damage and wear. Should the adjuster arm engage and rotate the star wheel then the system is working correctly. Should the arm fail to engage the star wheel then it is not operating properly is damage and requires replacing. Replace both wheel brake assemblies. Should the adjuster arm engage the star wheel however does not rotate it, then the adjuster assemblies require replacement. 5. Condition and Operation checks of the moving anchor assembly. Engage the brake lever checking for fluid motions. 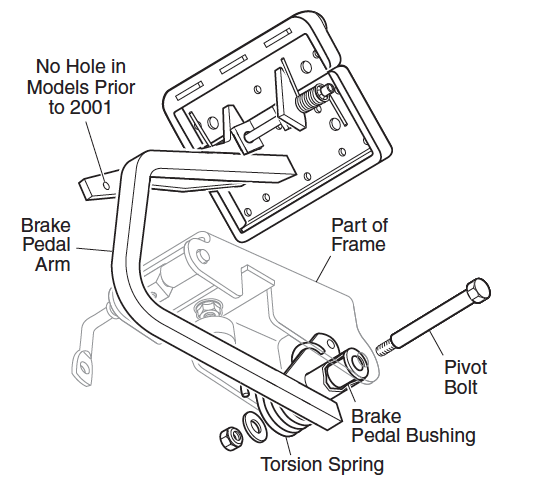 Should the moving anchor assembly bind or is damaged, replace both of the wheel brake assemblies. Carry out inspection for gouges, galling or damage. More importantly is the contact point with the brake shoes. Replace as necessary. 7. Measurement of the brake shoe thickness. Carry out measurement of the brake shoe exhibiting the most wear. The shoe thickness should be no less than .06″ (1.5 mm). Replace as necessary. 8. Inspection of the brake shoe springs. Check for brakeage or damage and are fitted correctly. The hooked spring end is fitted to the front shoe, with the other end fitted to the adjuster. 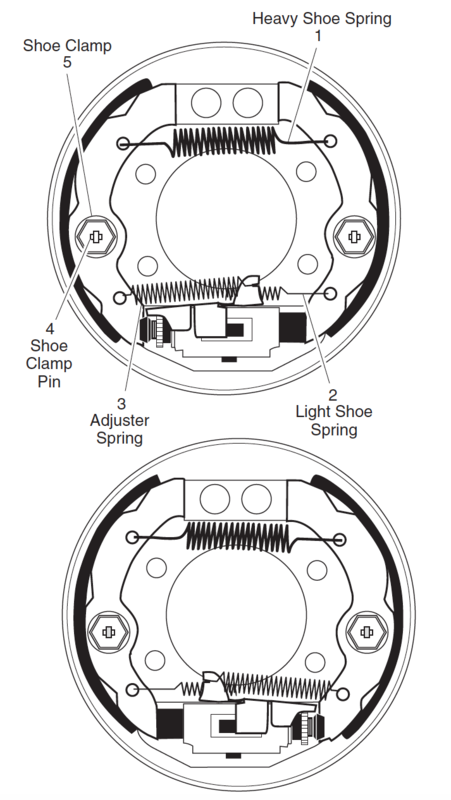 Brake shoe springs with the light spring near the adjusted mechanism, whereby the hook is fitted down inside the rear brake shoe and up inside the front brake shoe. The heavy top spring is fitted with all spring hooks fitted down inside the brake shoes. 9. Same procedure for other wheel brake. 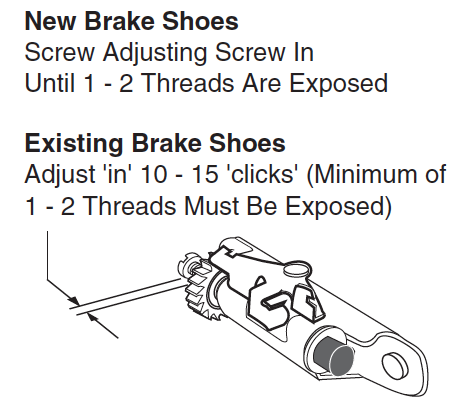 10.Inspect and adjust the brake pedals fluid travel. Brake pedal fluid travel is the gap the pedal moves from the stationary position to when the brake cables just begin to energize the brake levers. Adjusting the fluid travel is essential to ensure the brakes work correctly. If you experience too much pedal fluid travel you will have limited braking capacity. If you experience too little pedal fluid travel you will cause the brakes to not fully release. 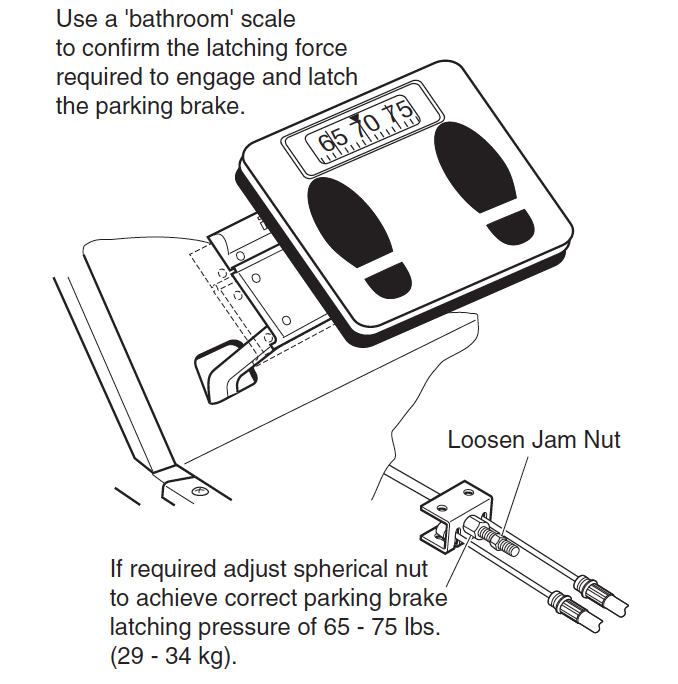 Adjust the brake pedal fluid travel by loosing the nut and rotating the spherical nut. Torque the nut to 10-11ft. lbs. (14-15Nm). The optimum brake fluid travel setting should be 7/8″-1 1/8″ (2.2-2.9 cm). Energize the brake pedal quickly and hard 4 – 6 times to find the actual fluid travel. Conduct a dynamic test by driving the cart slowly and energize the brakes quickly and hard. Allow the brakes to adjust freely and repeat test 10 times. 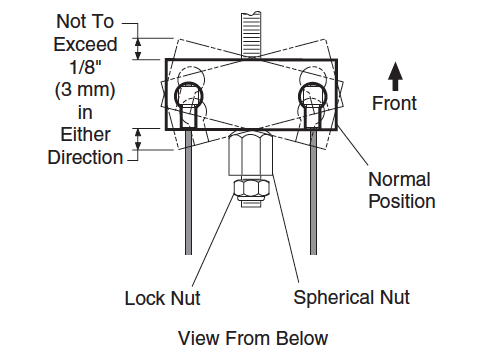 When completed adjust the fluid travel with the spherical nut. Drive the cart again slowly and brake quickly and hard another 10 times. Check that the fluid free travel does not change during braking. If it does keep adjusting the spherical nut and conducting the test. 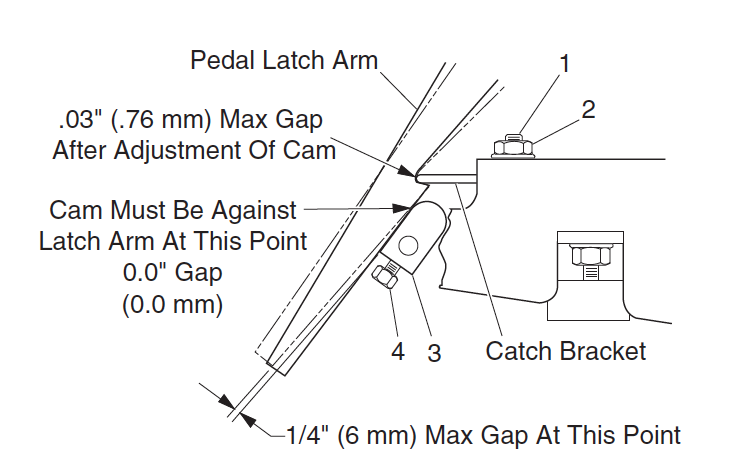 Inspect the clevis pins at the end of the brake cables and brake levers are slack. Slacken the star wheel to pull back the brake shoes and allow the brake drum to come off freely. Torque the nut to 80-90ft. lbs. (108-122Nm), do not exceed 140 ft. lbs. (190Nm). 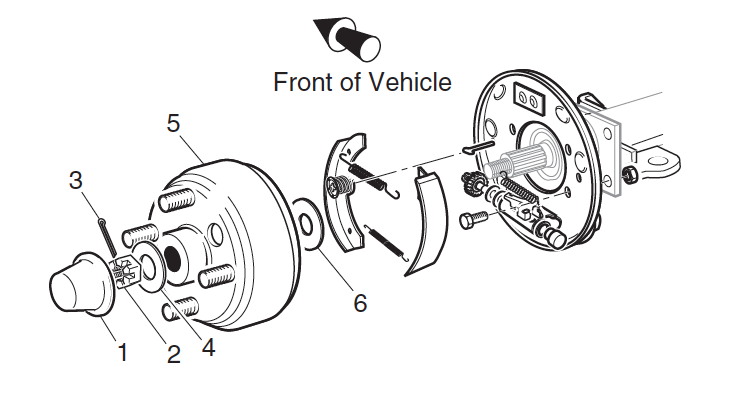 To service the wheel brake you must disassembly, inspect, lubricate and reassembly the wheel brake assembly. Any damaged, worn or corroded items are to be replaced. For reinstatement follow reverse points above. Locknut torque is 23-28ft. lbs. (31-38Nm). Adjust brake pedal fluid travel. 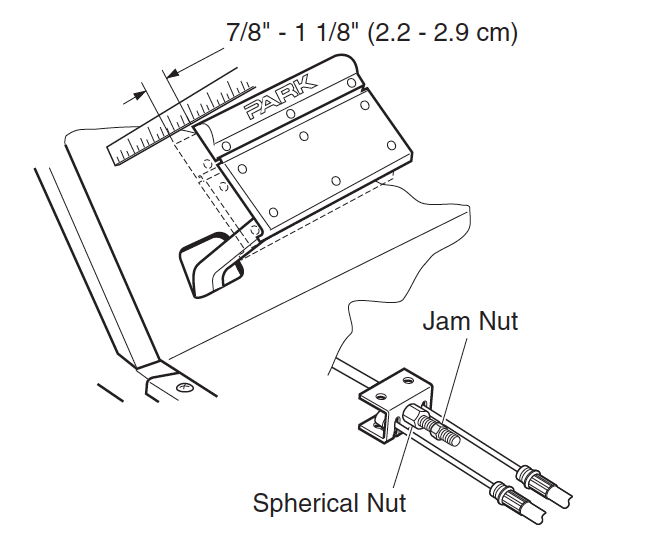 Installation is reverse of above, Lock nut torque is 25-29ft. lbs. (34-39Nm). Refit nuts and bolts torqueing to 85-95 in. lbs. (10-11Nm). To reinstate, fit the parking brake pedal and torque the push nut and pin. The brake pedal shall come into contact with the pedal bumper when then pedal is de-energized. 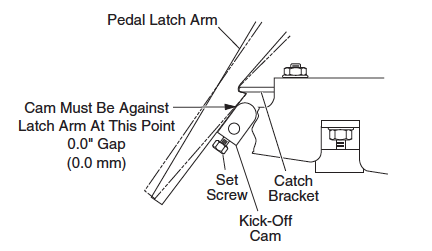 The distance from the pedal arm to the setscrew heads in the kick-off cam is ¼”-3/8” (6-9mm). 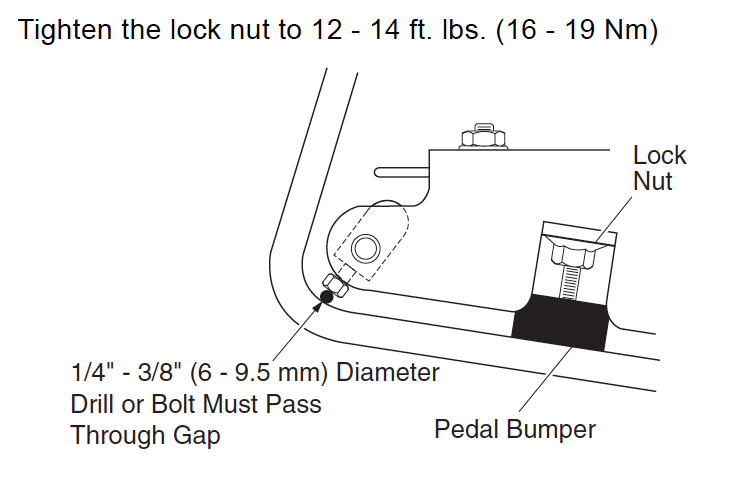 Torque the lock nut to 12-14 ft. lbs. (16-19 Nm). Installation is in the reverse of above. Torque the setscrews to 45-55 in. lbs. (5-6 Nm) torque.